Now the seed fell into good ground and grew to a great harvest, and in a little while they became a great nation, a people whom God had blessed. 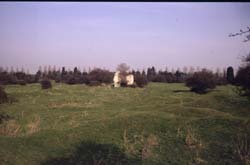 There are no standing remains of the site, but the layout is clear from surviving earthworks. The site lies on private farmland and cannot be accessed by the public.